Begin Simply: Autumn - rain or shine? Autumn - rain or shine? 4:55pm - umbrella dry and barely a dusting of rain. Also, a lovely reminder of why I love my Hugo Boss riding boots! Bring on the rain! 6:45am - walking to the bus stop umbrella packed and riding boots walking over wet foot paths. I would definitely hate to start a day with soaked feet knowing that I had quite a full day ahead. I debated whether to wear the riding boots, but there was really no debate as the boots are comfortable and definitely practical. I can say with confidence that the boots would score a 10 in comfort as I have even wore then on a flight! Their practicality, also a 10 as I have worn them in a down pour and ended the day with dry lower limbs and feet! In this case, the investment in these Hugo Boss riding boots have been worth every dollar and more. I like the bag and boots. Those boots look gorgeous! I've been considering getting a pair of riding boots after seeing so many beautiful pairs this winter - but I've been married to ankle boots for so long that it's hard to branch out haha! Thanks, I too, wear ankle boots a lot more then riding boots, but any hint of rain and I normally wear the riding boots because most of my legs won't get wet! 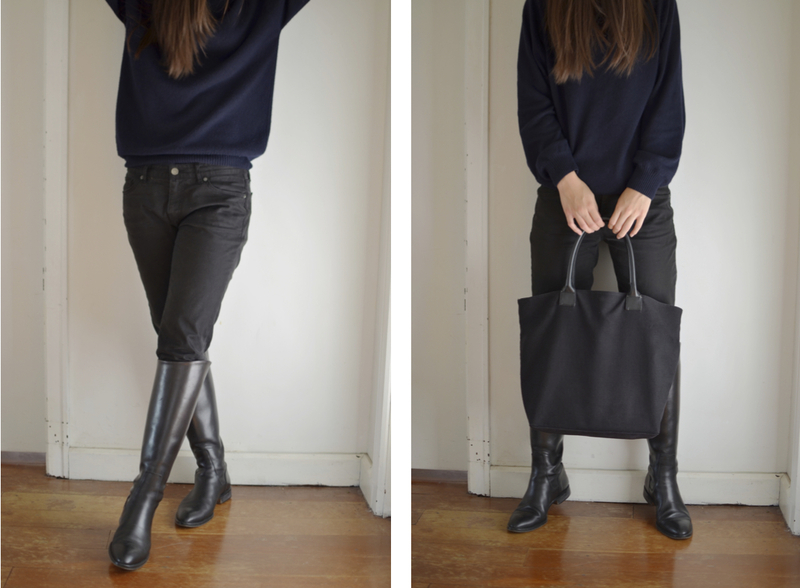 Riding boots go really good with jeans and even shorter dresses/skirts. I guess ankle boots pair well with the above, too. Hahaha, it was like the complete opposite for me, I saw so many amazing ankle boots recently! Thank you, Rachel! They were my first ever pair of boots and I just love them. I remember wishing for cooler weather and now it is Autumn I'm already longing for warmer days. Great books. I swear by riding boots at any hint of rain. I guess it comes from living in a city where I walk everywhere. Being able to beat the rain and wind make them amazing shoe staples for winter. I could never find a simple pair of riding boots with no hardware, the right amount of heel, at a doable price. But that's okay, most of my pants are tapered trousers and I only have 1 pair of skinny jeans to wear them with anyway. How are the Uniqlo jeans? Which ones do you have? Do they fit true to size, sag, bleed, etc? I reckon riding boots are really hard to buy. The lower/medium range riding boots more often then not seem to have embellishments, it's hard to find a simple pair. Have you thought about ankle boots? There are plenty more options and I also find that I wear my ankle boots more often then the riding boots! I have the UJ "skinny fit straight" range. At the start they were amazing pair of jeans but after 2 months they have stretched out quite a lot. I normally wear a belt with it now. After looking at the label I realised it has quite a high rayon percentage and that is the reason for the stretch. Now I would probably stick to a high cotton percentage jeans.